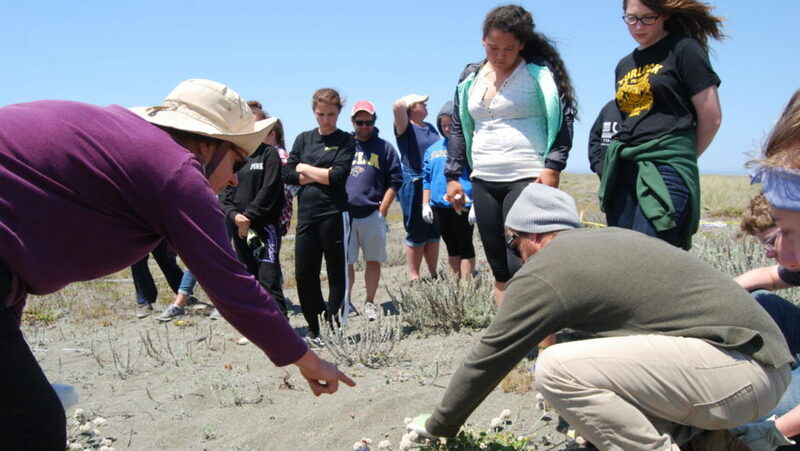 The Tolowa Dunes Stewards (TDS) are a small group of dedicated volunteers and part time employees working to restore and conserve a section of the Northern California coastline. Known regionally as the Tolowa Coast, this land is the aboriginal territory of the Tolowa people who have lived here since time immemorial. And for good reason! The Tolowa Coast is home to some of the most diverse plant and wildlife species in the state and was once able to provide abundant resources to the Tolowa people. Nowadays abundance has all but disappeared and that diversity is being compromised. Notably, European beachgrass (Ammophila arenaria) introduced in the mid 1800’s has since eradicated nearly all native dune plants, not only on the Tolowa Coast but in coastal dunes from California to British Columbia. This grass grows rapidly, outcompeting other plants and keeping the sand dunes from moving around as their dynamic nature intended. When the sand dunes grow artificially tall and plant diversity disappears, wildlife suffers as well. Food sources are lost and critical habitat disappears. Take the Western Snowy Plover for example. This small shore bird needs flat, open sand dunes which enable them to see predators from afar. European beachgrass has nearly eliminated that habitat and the Snowy Plover is now listed as a threatened species under the Endangered Species Act. European beachgrass has nearly eliminated that habitat and the Snowy Plover is now listed as a threatened species under the Endangered Species Act. This may sound grim but not all is lost. The efforts of our small group have been bolstered by one very BIG partnership. For the past 5 years we have been partnering with the Sierra Service Project and together we have been doing the impossible. Every summer hundreds of volunteers descend upon the dunes for a day of restoration. We pull out the invasive grass in large quantities. We talk about the native dune plants and the animals that benefit from this work. And most of all, we have a great time. By the end of the summer, staff members feel like family and year after year we look forward to seeing people return. For the past 5 years we have been partnering with the Sierra Service Project and together we have been doing the impossible. Removing European beachgrass is difficult, time consuming, and can feel downright hopeless when you look out at all the grass beyond. But the power of service and commitment has prevailed. This continued partnership has helped to restore 5.5 acres of dune ecosystem. What does that number mean you ask? Well, a lot of things. For starters it means we are seeing positive results with the return of endemic plant species. In one recent count at our restoration site we found 200 Phacelia argentea or more commonly, silvery phacelia – a small but remarkable dune plant that grows almost exclusively in the Tolowa Dunes. Additionally, restoring 5.5 acres with an all volunteer work force is a feat that has not gone unnoticed. Recently a state organization called the Wildlife Conservation Board noticed our volunteer led efforts and invited the Tolowa Dunes Stewards to apply for a large grant to aid our restoration efforts. We were awarded that money and have some exciting restoration projects lined up. And we could not have done it without the hard work and dedication of the Sierra Service Project. We are looking forward to big changes ahead and another great season with SSP! This continued partnership has helped to restore 5.5 acres of dune ecosystem. Editor’s Note: Tara Dettmar will again be one of our Tuesday night community speakers and Adventure Wednesday leaders in Smith River in 2019. She is a fisheries field biologist with the Smith River Alliance. Join her by serving in Smith River, CA this summer! Sharing a meal is a universal experience. We might cook, clean, or prepare the food; we might host the dinner; we might build the very house in which we eat — or, we might be a guest, warmly welcomed by friends old and new. Regardless of our role, it is a joy to gather in community and be nourished. 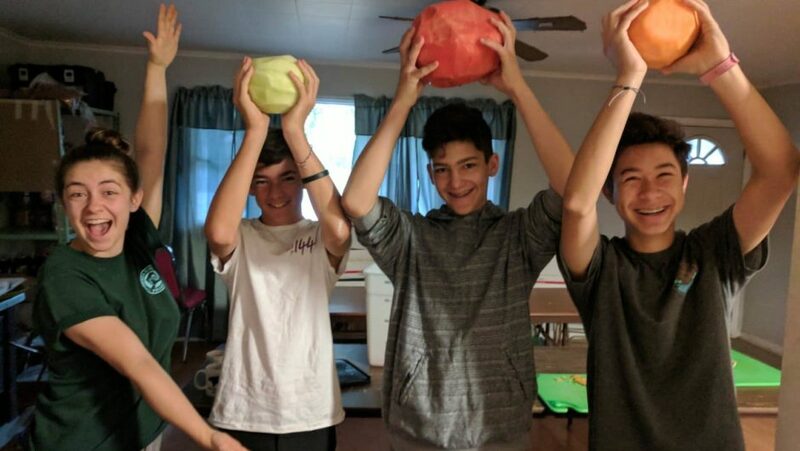 At Sierra Service Project, we strive to ensure there is a place at the metaphorical table for everyone, from our youth and adult volunteers, to our local site partners, to the community members we serve alongside. This year at SSP, we will continue to foster this spirit of invitation, generosity, and love for our neighbor with our summer theme: A Place at the Table. With Jesus’ ministry as a guide, SSP strives to create an environment in which every individual feels welcomed, heard, and included. In our modern world, youth and people on the margins often feel they don’t have ‘a place at the table,’ or that their voices are undervalued. At SSP this summer, we invite you to come as you are, bringing all your thoughts, emotions, doubts, and beliefs. Together, all will gather to create, enjoy, and be nourished by the meal – literally and metaphorically. As an organization, SSP prioritizes the voices of historically marginalized groups, and we envision a world in which everyone has a place at the table. From the native peoples of the Spokane Indian Reservation and Navajo Nation, to multigenerational immigrant families near the San Diego-Tijuana border, we seek to elevate the voices of our hosts, learning from and listening to those we serve. During our summers, we have the privilege to be guests in these communities; to sit at their tables and hear their stories. We all come to the table with diﬀerent gifts. We honor these gifts as valuable in their own right, and know that when we gather in community, we are greater than the sum of our parts. Even those who feel they have nothing tangible to give are invited to share their gifts of spirit and togetherness. Sharing of one’s self and story is equally impactful and celebrated – sometimes, just showing up is enough. Similarly, through serving others, we will learn when to give, and when to take time for ourselves. We want to encourage young people to share their needs, and know it’s okay to lean on community for support. One tradition SSP will draw from this summer is that of the ‘moveable feasts’ in the Christian calendar. These are liturgical feasts that, as the name implies, can be moved to diﬀerent days depending on the year. In the spirit of the ‘moveable feast,’ we aim to carry the community we create at SSP and stories we learn back home with us, living out the values we cultivate at SSP in the ‘other 51’ weeks of the year. As we grow in assurance of our own place at the table, we also ask more of ourselves — more empathy, more forgiveness, more active declarations of love for all people — and empower volunteers to pull up a chair for those who don’t yet have a seat, by advocating for and with these communities upon returning home. You have a place at the table. We invite you to join the table at SSP this summer, and discover together how we might make this table big enough for the whole world to share. Editor’s Note: Cseca Gazzolo will be returning to SSP summer staff for her second year as a Spiritual Life Coordinator in 2019. She is one of seven people on this year’s spiritual program planning team, which includes SSP staff, clergy, and youth leaders from throughout the Western United States. Join her by serving in Tsaile, AZ this summer! The natural beauty that surrounds Chiloquin creates a powerful experience. Because the town of Chiloquin itself is so small, the opportunities to see the areas around it allow for a distinguishable connection with nature. The spirit walk location overlooks great views of the land, lakes, and all the way to the mountains on the other side. Being so high up, there is so much to see and take in. The scenery was so vast that I was able to pick up on something new every week of the summer. Chiloquin’s Adventure Wednesday spot at Collier State Park, by contrast, is nestled in the trees by the Williamson River. What’s especially cool about this location is that volunteers got to do their Wednesday service there, swim in the river, feast on a barbecue dinner, and worship through evening program. The park rangers who led the Wednesday work were wonderful in educating the volunteers about fire prevention and upkeep of the natural space, but even more special was the opportunity they gave volunteers to plant trees! This made for quick gratification for the volunteers, being able to go from seeing an empty space on the ground at the start of the day, to saying “I planted that tree” by the end of the work day. It was especially neat knowing that before that, most of the volunteers wouldn’t have been able to say that they had planted a tree. Everyone was really excited about it, and got to stick around and continue to appreciate their work for the rest of the day. I personally never got tired of smelling those ponderosa pines. It may be a trivial detail, but a very real joy. I suggested giving those trees a sniff to many a volunteer, and whether that was met with confusion, skepticism, or no question at all, no one was disappointed by the experience once they leaned in for a whiff. 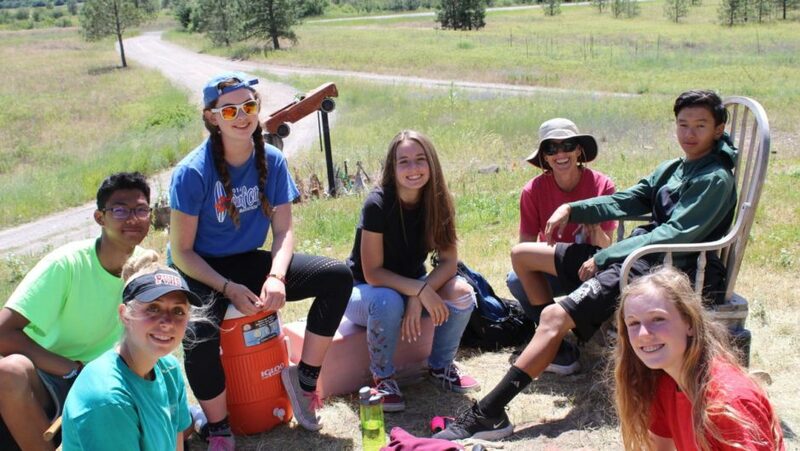 Editor’s Note: Caroline Hines has served on summer staff for two summers and will be returning to Chiloquin as the Spiritual Life Coordinator in summer 2019. Caroline attended SSP as a youth volunteer with Half Moon Bay United Methodist Church. There is still space for volunteers to serve in Chiloquin this summer. Check out the current availability here.